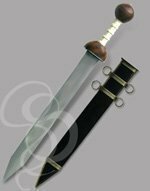 This sword is a replica of the one used by Russell Crowe in his portrayal of General Maximus Decimus Meridius in the film “Gladiator”. 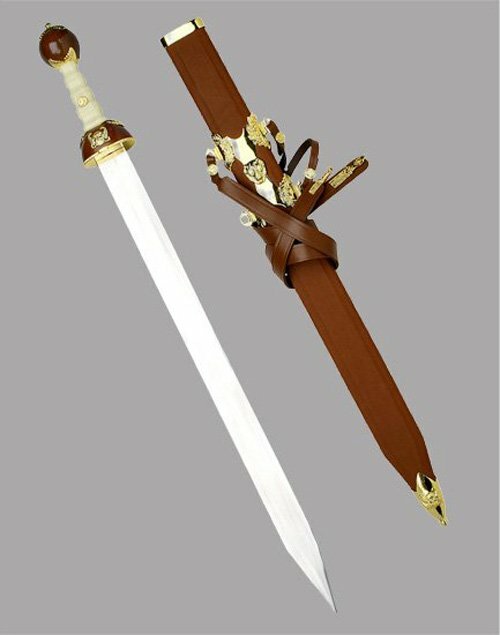 The sword is strictly for decorative or costume use but its ornate appearance makes it an impressive piece. It features a 29 inch polished un-sharpened blade constructed of 440 stainless steel. The long clean blade is ideal for adding a personalized engraving. The guard and pommel of the sword are made of polished wood with a glossy finish and accented with golden trimmings. The handle, although plastic, is similar in appearance to the bone handles characteristic of gladiuses. Embedded in the grip is an imitation golden coin bearing the profile of a Roman emperor. 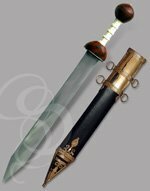 The scabbard is wooden with a brown leather cover and has golden fittings on the throat and tip of the scabbard. The scabbard also has leather shoulder strap which is adjustable for use over the right or left shoulder. The blade is un-sharpened. The sword ships with a Care and Cleaning kit.